The largest industrial gas company in the Americas, Praxair has started to build a liquid oxygen production base in Chongqing, the largest of its kind in China, it announced on Tuesday. Upon its completion in late 2014, the base is expected to provide 5,000 tonnes of liquid oxygen per day to local industrial enterprises, said Zhang Xuetao, vice president of Praxair (China) Investment, headquartered in Shanghai. Situated in the Changshou Chemical Park, the production base will be run by a joint venture co-established by Praxair and Chongqing Chemical and Pharmaceutical Holding (Group) Company with a total investment of 1.1 billion yuan ($177 million), according to Zhang. The vice president said Praxair would supply two sets of up-to-date, energy-efficient and environmentally friendly gas separation devices and aims to develop the production base into an industrial model in China. 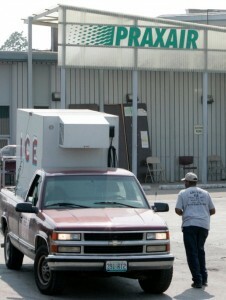 Praxair is the largest industrial gases company in North and South America, and one of the largest worldwide, with annual sales of more than $4 billion. The company produces, sells and distributes atmospheric, process and specialty gases, and high-performance surface coatings. Praxair is also the world’s largest supplier of carbon dioxide.